Mesa Safe was founded by a professional lockpicker. CEO George Vincente got his start as a locksmith 40 years ago. Mesa safes are especially secure because the company owns several different innovative lock patents that make it harder for crooks to gain access. Over the years, Mesa Safe has carved out a niche for itself building affordable deposit safes for small business owners. Mesa Safe has pioneered a manufacturing technique that allows it to build safes for a fraction of the cost while still maintaining Mesa quality. Recently, Mesa Safe has reinvested the profits it has earned selling safes to commercial businesses into improving its residential products. As a result of its savvy decision making and commitment to ingenuity, Mesa Safe is now one of the most dominant safe manufacturers in the world. Mesa Safe’s 30 Gun Safe is a heavy duty monster. Because of its extra thick steel walls, it’s about 300 pounds heavier than the average gun safe of this size. It can also withstand 1750 degree heat for an hour– that’s twice as long as most gun safes. Large size. This safe is 59 inches tall, 32 inches wide and 22 inches deep and can hold 30 guns. Lots of room inside. With this safe, you get a total of 13 cubic feet of storage space. Extra thick steel. Once they’re inside this safe, your valuables will be protected by 1 and 1/2 inch thick steel walls. Incredible fire resistance. The steel walls mentioned above provide 1 full hour of protection against 1750 degree heat. Adjustable shelves. If you’re storing more than guns, you can use the included adjustable shelves to organize your belongings. Carpeted walls. All the internal walls are covered with protective fabric so that you won’t scratch your guns when you put them away or take them out. Electronic lock with backup key. If the electronic lock gets damaged, you can still gain access to your valuables by using the backup key. This safe is so extremely heavy that it may damage your floor over time. Measuring 59 inches high and only 22 inches across, this safe is tall enough to accommodate long guns yet small enough to squeeze into a cramped storage room. Like Mesa Safe’s other strongboxes, this one is equipped with high end features like an internal electrical outlet, a tamper proof lock and adjustable shelves. Fits into a tight area. If you don’t have enough space for a full sized gun safe, this one is a good compromise. Heavy duty. Like all Mesa Safe products, this safe has extra thick steel walls and more fire resistance compared to the competition. Complex lock. This safe’s 12 bolt locking mechanism will keep your guns out of the hands of thieves and intruders. Adjustable shelves. Some safes have fixed shelves that can’t be moved around, but this one allows you to set up the interior however you like. Accommodates long guns. The shelves can be moved around to make space for up to seven long guns. Electrical outlet inside. The plug allows you to power a humidifier, a light or any other electronic device. Carpeted walls. The protective fabric on all of the interior surfaces prevents you from scratching your guns on the metal walls. Mesa Safe’s warranty only gives you 1 year of insurance against manufacturing defects. If you’re looking for a massive safe that can survive pretty much any disaster, Mesa Safe’s extra large 42 gun strongbox may be exactly what you need. During the testing, Mesa dropped this safe off of a two story building. The safe not only survived– it also protected the guns that were stored inside it. Resists massive impacts. This safe still worked even after testers dropped it from a two story building. Extremely large size. Measuring in at 24 x 36 x 71 inches, this is the largest safe in the Mesa Safe catalogue. Attractive design. The retro lettering and bronze hardware are very easy on the eyes. Internal electrical outlet. The plug allows you to install electronic devices inside the safe. Super fireproof. This safe will withstand a blazing fire for over an hour. Fabric coated walls. The carpeted walls prevent nicks and scratches. White glove delivery available. 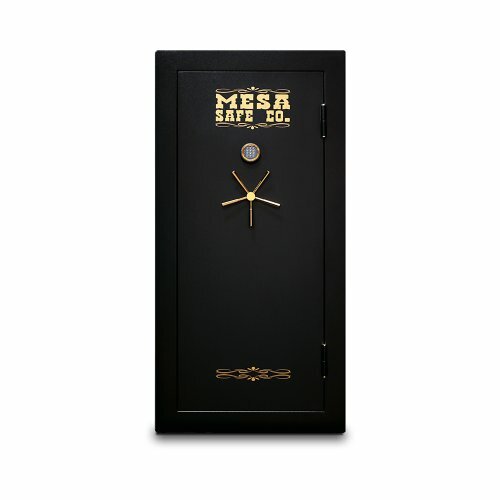 If you’re willing to pay an extra $700, Mesa Safe will send a delivery team to install this safe in your home or business. The $700 white glove delivery charge costs almost as much as the safe itself.